COLOMBO, Sri Lanka (AP) — A deputy minister resigned Tuesday from Sri Lanka's government after the appointment of a former strongman as prime minister plunged the country into a political crisis. Sri Lanka has been engulfed in turmoil since President Maithripala Sirisena dismissed Prime Minister Ranil Wickremesinghe last month and replaced him with ex-strongman Mahinda Rajapaksa. The resignation of Deputy Minister of Labor and Foreign Employment Manusha Nanayakkara came a day after Parliament Speaker Karu Jayasuriya said he will continue to recognize Wickremesinghe as prime minister until Rajapaksa can demonstrate he controls a parliamentary majority. In a letter to Sirisena, Nanayakkara said he agrees with the speaker's stance. His resignation is seen as an upset for Rajapaksa's efforts to obtain a majority in Parliament. Since his ouster, Wickremesinghe has remained in the prime minister's official residence and insists he is still the legitimate leader. Both Wickremesinghe and Rajapaksa say they command a majority in Parliament. They are expected to face a floor test when the 225-member house meets Nov. 14 after being suspended for about 19 days. Wickremesinghe said in an interview with The Associated Press last week that there is credible evidence that Rajapaksa's party is attempting to buy support in Parliament. Lawmakers from Rajapaksa's party have denied the allegation. Seven members of Wickremesinghe's United National Front have defected to Rajapaksa's side. During the weekend, the Tamil National Alliance — an ethnic minority Tamil party — said it will support a no-confidence motion against Rajapaksa, after one lawmaker from the party joined Rajapaksa's government. The Tamil party's 15 votes could give Wickremesinghe's camp a decisive edge over Rajapaksa. 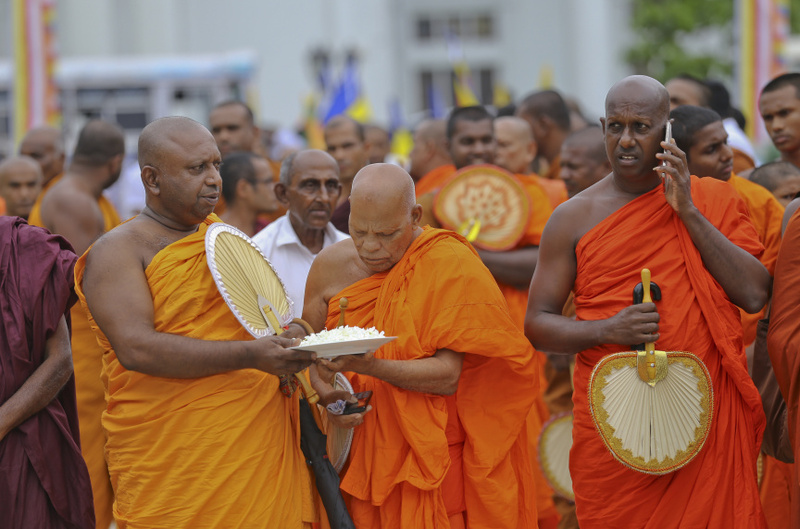 Separately Tuesday, hundreds of Buddhist monks supporting Wickremesinghe gathered in Colombo and urged Sirisena to end the political crisis and restore democracy. Sirisena has said Wickremesinghe was sacked in part because he and a Cabinet colleague were behind an alleged assassination plot against the president. Details of the alleged plot have not been disclosed and Wickremesinghe has repeatedly denied the accusation. Tensions had been building between Sirisena and Wickremesinghe for some time, as the president did not approve of economic reforms introduced by the prime minister. Sirisena was also critical of investigations into military personnel accused of human rights violations during Sri Lanka's long civil war against a Tamil separatist group, which ended in 2009. Rajapaksa, who ruled as president from 2005 to 2015, is credited as a hero by the ethnic Sinhalese majority for winning the conflict. On Monday, tens of thousands people marched in Colombo in support of Rajapaksa.